I think it unlikely that we will have a second referendum before we leave in 2019. Brexiteers fear losing it and Labour fears fighting it. So why ask the question? It will become clear. I think if a second referendum was just a rerun of the first, then Remain would win comfortably. It is now pretty clear there will be no £350 million a week for the NHS, and instead as the OBR suggests there will be less money if we leave the EU. The economic concerns that the Leave campaign so effectively neutralised with ‘Project Fear’ are now becoming real: we had a depreciation (as predicted), real wages are falling, and GDP per head in the first half of the year is almost stagnant. I could go on, but this is enough for many Leavers to change their minds. Partly because of this, a second referendum would not be a rerun of the first. Leave would have a new theme, which they would plug away at relentlessly. They would argue that the very existence of a second referendum was an attack on democracy. The people had already decided, and a second referendum was an attempt by MPs to take power away from the people. The people needed to take back control from MPs as well as the EU. They would argue that you should vote to Leave again to preserve democracy. The simple point that people should be allowed to change their mind would be met by lots of rhetoric that sounds convincing. If a second, why not a third? Referendums are meant to last a generation, and not to be held every few years. (Quotes from David Cameron saying similar things from the last campaign would be trotted out.) We know from the polls that this argument has power, as many people who voted Remain think that nevertheless we should respect ‘the will of the people’. Many think that on a constitutional issue like this, a referendum should override the views of MPs, and will feel that by voting Leave they will be upholding this principle. In this sense it would be like the Labour leadership election in 2016, which Corbyn won in part because members felt MPs were trying to take members power away. In addition, Remain campaigners just saying a majority of the electorate didn’t vote for Leave because some people did not vote will not convince anyone. Simply asserting that the original Leave campaign was based on lies is also not sufficient, because all election campaigns involve politicians telling lies of some kind. We need much better arguments than this if we are going to convince Remainers who think the original referendum result should stand. A good place to start is a post by Richard Ekins, a Professor of Law at Oxford University, who argues “Political fairness and democratic principle require one to respect the outcome of the referendum even if one is persuaded that Brexit would be a very bad idea”. His arguments are strong and they need to be addressed (as I tried to do in March). We need to argue that the chosen electorate for the first referendum was not fair, and to allow just a simple majority to decide such an important and potentially irreversible event is not democratic, even after the event. We need to argue, as I tried to do, that the lies told by the Leave campaign went well beyond what normally happens in an election. In these circumstances a referendum result is not something to respect, but something you resist with all your power. Remain campaigners also need to be politically realistic. To say, as some do, that Labour’s commitment yesterday (to staying in the Single Market and Customs Union during the transition period) means nothing and is “not good enough” because it still involves leaving the EU in 2019 completely misunderstands political realities. Brexit is not going to fall apart of its own accord. As George Eaton argues (see also Stephen Bush), the best bet for reversing Brexit is through a Labour government. Given this, to suggest that Labour would campaign against Brexit if it wasn’t for Jeremy Corbyn is both misdirected (it ignores many MPs in Leave voting constituencies who think Labour have to support Brexit) and counterproductive (if Brexit is reversed, it will likely be by a Labour government under Jeremy Corbyn). Now I like to think I do none of those things, and I know some of those campaigning to Remain who do not do these things either, but I can also see that others might take a much more aggressive and purist approach. This is a strange but I think real phenomenon: the less likely something is to happen, the more some demand that only it will do. The reality is that staying in the Single Market and Customs Union outside the EU permanently is a lot more likely than simply staying in the EU, and less costly that leaving either. Because it is obviously inferior to staying in the EU it may be how rejoining the EU eventually happens. Those campaigning to Remain are in no position to be aggressive or absolutist. A referendum where Remain is an option, and assuming we leave in 2019 and the Conservatives remain in power until then. I was thinking about this in the context of a paper I have just finished which uses a diagram that Adrian Pagan used to describe different types of macromodels. The diagram, which you can find in an earlier post, has ‘degree of empirical coherence’ and ‘degree of theoretical coherence’ on the two axes. Particular macromodels can be placed within this space. At one extreme involving the highest theoretical coherence but weaker empirical coherence are microfounded DSGE models. At the other are VARs: statistical correlations between a group of macro variables with no theory-based theoretical restrictions imposed. In the middle are what I call Structural Econometric Models and Blanchard calls Policy Models, which use an eclectic mix of theory and econometric evidence. If you have a simple view of the hard sciences, this diagram looks very odd. Theories either fit the facts or they do not. But I think a medic could make sense of this diagram by thinking about medical practice based on biology (for example how cells work and interact with various chemicals) and practice based on epidemiological studies. Ideally the two should work together, but at any particular moment in time some medical ideas may borrow more from one side or the other. In particular, statistical studies could throw up links which do not have a clear and well established biological explanation. Now imagine the microfoundations hegemony in macroeconomics applied to medicine. Statistical longitudinal studies in the 1950s showed a link between smoking and lung cancer, but the biological mechanisms were unclear. The microfoundations hegemony applied to this example would mean that medics would argue that until those biological mechanisms are clearly established they should ignore these statistical results. The investigation of such mechanisms should remain a top research priority, but for the moment advice to patients should be to carry on smoking. OK, that is perhaps a little harsh, but only a little. That some macroeconomists (I call them microfoundations purists) can argue that you should model and give policy advice based not on what you see but on what you can microfound represents something that I cannot imagine any philosopher of science taking seriously (after they had stopped laughing). Over the last few days the BBC has given considerable publicity to Patrick Minford’s new report published by the ‘Economists for Free Trade’. I have looked at both the BBC News website entry and listened to the Radio 4 Today programme’s discussion. They are both classic ‘2 sided controversy’ formats, with Monique Ebell from the National Institute of Social and Economic Research (NIESR) providing the main opposition. So why was this coverage something the BBC should be deeply ashamed about? There are two main reasons, but first let me make a more general point which applies to journalism more generally. There is no quality control in most of the media when it comes to giving publicity to a report like this. There is a very simple reason for this, and that is the primacy given to immediacy. In a better world, when a report like this came out, journalists would spend a few days ringing around to see what the reaction of other experts were, or nowadays just look at reactions on twitter. In this particular case such a strategy would have thrown up some apparently large errors, and this should have led journalists to question whether they should give the report any publicity. They might at the very least have waited until the full report was published next month. Let me give an analogy. Suppose a report of a medical trial had suggested a miracle cure for some serious disease. The report had not been peer reviewed, and its author had connections to a drug company that stood to benefit from the alleged cure, but the BBC had decided to give it considerable publicity nevertheless. Within days it became clear that there were serious problems with the report, and that there were other existing papers that came to a completely different conclusion. The BBC would then look very foolish, and many sufferers from this disease would have been given false hope. I suspect for that reason the BBC would be much more cautious. Yet if the report is about a subject matter with any political implications this caution appears to go out of the window. Now let me get to the two reasons why the BBC should be ashamed in this case. First, Patrick Minford is no expert in international trade. He is a macroeconomist, who in his younger, less obviously political, days served as something of a role model for me. He published a very similar argument about the benefits of unilateral trade liberalisation during the referendum campaign. It was heavily criticised by individuals or groups that are experts in international trade. So we have already had the quality control, yet the BBC decided to ignore that. Returning to my analogy, it is as if there had been earlier claims of miracle cure that had been thoroughly debunked by medical experts and the BBC had ignored these. Second, at no point in either of the two items I looked at is there any mention that the overwhelming consensus among academic economists is that Brexit would be harmful to the economy. We just have reports that give two opinions, with no context whatsoever about which opinion is the consensus view and which is the maverick. It is exactly equivalent to giving considerable publicity to a report from some climate change denial outfit, and including a response from one or two climate scientists with no mention of what the consensus among climate scientists is. Again to draw on my analogy, it is like reporting a miracle cure and failing to say that nearly all doctors thought this was rubbish. On both counts, this is very bad journalism, even if you do not think economics has the same standing as medicine. The BBC may have thought they had brushed off complaints from economists, but here is a specific example where they really do have a serious case to answer. As Ben Chu rightly says: “The legitimate news story around Minford’s work is how bad science can survive and thrive when it supports the desires and prejudices of powerful people in our society … the BBC ... has become part of the problem.” Brexit is the Emperor's New Clothes, and no one - including the BBC - dares say that the Emperor has no clothes. Not easy but not impossible: it would cost a few thousand pounds in research time for someone to go through the main news reports during the Brexit campaign and establish how many times the economic consensus was mentioned. Channel 4 News did put the point to Minford that many economists thought his work was flawed, to which he responded by saying “all these trumped up economists and the consensus they are all hired hands”‘. A very political answer from a very political economist, and therefore very revealing, but not a question the BBC apparently thought worth asking. I talked last week about how the Leave campaign involved lies at its centre. Not the occasional exaggerations of the Remain campaign, but claiming things that were the opposite of the truth. Like there will be more money for the NHS, when in fact there will be less. That particular lie probably swung the result, according to the man who organised the Leave campaign. Labour people tell me that public opinion on Brexit will turn once these lies become apparent, and at that point Labour can safely take up the Remain cause. What this overlooks is that the managing of information characterised by the Brexit campaign continues. The Tory tabloids continue to distort the truth, and the Telegraph acts in a very similar fashion. The UK government appears more interested in saying stuff to please its UK audience than actually negotiating with the EU, and its studies of the impact of Brexit remain secret . Meanwhile the opposition give no hint of the costs that Brexit will involve, and by design or conflicted confusion are just a tiny bit less pro-Brexit than the government. The broadcast media, and particularly the BBC, appear hopeless at questioning the facade that both main parties and supporting think tanks have erected. I have never heard a politician pulled up for saying we must retain access to the Single Market: all countries have access to that market! (This is the kind of journalism we should be seeing.) Individual MPs are intimidated into silence by the power of the Tory tabloids. When I talk to Leave voters, all they tell me is how the economic ‘catastrophe’ predicted by Remain did not come to pass, or other Leave nonsense talking points like the exchange rate was overvalued anyway. They are often unaware that falling real wages are the direct result of the Brexit depreciation, and as a result the economy hardly grew in the first half of this year. They, and many people who voted Remain, do not realise that the government’s position papers are largely fantasy and that the EU is in a position to dictate terms. This is not because these voters minds are closed. They just get their information from sources that go along with the government’s Brexit fantasy, unless they are fortunate enough to read the Financial Times. No wonder there has been no major change in public opinion since the referendum. Some time ago I calculated a conservative estimate for the cost of austerity, and it was £4,000 per household. Ironically it was based on OBR estimates that the MSM largely ignored, just as they ignore the OBR’s estimates for the short term cost of Brexit. But my austerity cost estimate was a total cost, over all the years of austerity. The Treasury estimate is a cost each year. There is therefore a strong liklihood that Brexit will be far far worse than austerity in terms of lost resources, and unlike austerity there is no way of avoiding these costs once we are outside the Single Market. For Labour party members and MPs I would put it this way. Imagine winning the next election but having to accept continuing austerity. Winning an election after leaving the Single Market will probably be much worse, and of course the media and voters will blame it all not on Brexit but on Labour’s ‘far left’ policies. Winning an election after Brexit is a poisoned chalice. Here is Mike Galsworthy on this and the earlier 'Balance of Competences' reviews that the government kept very quiet about before and during the referendum. I’ve talked to people at the BBC, including their economics editor, about why they cannot apply the BBC Trust’s recommendations on science coverage to economics. (The Trust’s conclusion, in summary, is that in controversial areas the BBC should go with the overwhelming scientific consensus. In other words recognise scientific knowledge, and not treat it as just an opinion.) I think a summary of their response to my question is that economics should not be regarded as a science: there is no economic knowledge, just opinions. What that attitude means in practice is that the public do not hear from the many experts in international trade we have in the UK (and there are many), but instead they hear from Patrick Minford. This is why the lies told by the Leave side are so critical. People tell me this is not important because most elections involve politicians lying. I'm afraid this is exactly equivalent to saying that Trump is just another politician who lies. It should be obvious that Trump and today's Republican party are something new and dangerous: people who tell blatant lies all the time about crucial issues and construct an alternative reality with the help of media outlets like Fox News. In exactly the same way, those in charge of Brexit live in their own imaginary world supported by the pro-Leave press. It is this imaginary world that they got 52% of the electorate to vote for. That alone is enough to completely discredit the referendum as an exercise in democracy. But there is more. The debate we should have had during the referendum was about the costs and benefits of immigration, This never happened because the person leading the Remain campaign had spent so much of his political life stoking up fears about immigration. It is hardly surprising that so many people voted to end free movement when both campaigns were united about immigration being a problem and way too high. The referendum campaign was like a boxing match where one side tied one of his hands behind his back and the other side brought knives. Respecting the referendum result means passing all this off as just normal. It is not normal. It is no more normal than Republican's taking health insurance away from millions. It is like an election held by an authoritarian state that runs a xenophobic campaign and controls much of the means of information. In that case we would say that this authoritarian state respected democracy in only the most superficial sense, and the same was true for the EU referendum. We cannot say that we should respect the right of people to make mistakes when the information they were given was so untruthful. The people voted for Trump and it is right to struggle to limit the damage and overturn that result after 4 years. Those who struggle against Trump are not disrespecting democracy but fighting to preserve it. In the same way it is right to limit the damage the referendum vote does and reverse it whenever that opportunity arises. I understand those who say that in today's political environment anything other than another referendum is politically impossible. I understand why it benefits the opposition to sit on the fence and triangulate. But please do not tell me that by being politically expedient in this way you are keeping the moral high ground. There is nothing noble in defending an exercise in democracy that was as deeply flawed as EU referendum. It is no accident that the only major overseas leader that supports Brexit is Donald Trump, and that those pushing Brexit hailed his victory. Brexit is our Trump, and the sooner both disappear the better the world will be. Although what is the point of Labour hedging bets on keeping in the customs union? It makes their Brexit strategy look much more like confused and conflicted than strategic triangulation. It is very easy to tell the difference between political expediency and political conviction. Imagine the very unlikely event that parliament votes to end Brexit. Would you join demonstrations outside parliament calling this an affront to democracy, or would you breath a huge sigh of relief? Postscript 17/08/17 If you think that these lies were not important in influencing the result, then you should read what Dominic Cummings who ran the Leave campaign thinks: in particular the paragraph that starts "Pundits and MPs kept saying"
As the Global Financial Crisis (GFC) and consequent recession were in progress, the Labour government looked at how fiscal stimulus could be used to moderate its impact. This would increase the budget deficit that was already rising as a result of the recession, but they knew that cutting interest rates alone would be insufficient to deal with this crisis, and that you do not worry about the deficit in a recession. That is Econ 101, i.e. basic macroeconomics, and it is 100% correct. Here Osborne and his advisors saw a political opportunity. Before the recession, fiscal policy had been all about meeting the government’s fiscal rules about debt and deficits, because monetary policy looked after smoothing the business cycle. There had been much discussion about the extent to which Gordon Brown had been fiddling these rules. Osborne could therefore make political capital over the rising deficit, particularly if he could suggest the deficit represented fiscal profligacy rather than the result of the recession. But what about Econ 101? The advice he was given (I suspect) was reflected in a speech he gave in 2009. This gave a short account of the history of macroeconomic thought, and described how the New Keynesian model underpinned his macroeconomic policy. It said that in today’s world the consensus is that monetary policy not fiscal policy dealt with moderating booms and recessions. Yet it failed to mention that this idea no longer worked when nominal interest rates hit their lower bond. And that unconventional monetary policy was powerless in the New Keynesian model. The speech was given a month after interest rates hit their lower bound. As an economic choice his policy was crucially out of date, but as a political choice it was almost brilliant. The line he pushed on the deficit came to dominate the media narrative, which I was later to describe as media macro. It did not win the 2010 election outright, but it went on to win the 2015 election. I say almost brilliant, because it has proved the undoing of his successor. The economic damage done by cutting government spending at the one and only time monetary policy could not offset its impact was immense. I think it is no exaggeration to call it the most damaging UK macroeconomic policy mistake in my lifetime as an economist. It was damaging in part because politics drove two additional features of his policy after he became chancellor in 2010. First, the austerity policy would have had less economic impact if most measures had been delayed until later into the 5 year term of the coalition government. But that would have meant deep cuts before the next election, and Osborne could see that would do political damage. Second, although the fiscal rule did not require it, public investment was cut back sharply in the first few years, because investment is often easiest to cut. As I say in that 2015 post, those cuts in public investment alone could have reduced GDP by 3%. By 2010 you need to introduce other actors who played a part in these mistakes. The Treasury did what the Treasury unfortunately often does, and put public spending control above the macroeconomic health of the country. The Governor of the Bank of England pretended that losing his main instrument didn’t matter, even though I’m told the MPC had almost no idea what impact unconventional monetary policy would have. If either institution had acted better perhaps the damage done by the austerity policy could have been moderated, but we will never know. But the main damage was done when the Conservatives were still in opposition. Did the policy of opposing fiscal stimulus start off as a policy to reduce the size of the state under cover of deficit reduction: what I call deficit deceit? Or was it just something to beat Labour with: the first in what proved to be a long line of bad economic judgements simply designed to wrongfoot his opponents. Without the actors involved telling us, I think it is impossible for us to tell. However there are two things I think we can clearly say. First, if it started as ignorance rather than deceit, it turned into the latter as Osborne prepared to repeat the policy all over again before the 2015 election, while at the same time cutting taxes. Second, if it started as ignorance it is far too kind to call it a mistake. It is similar to someone who has never learnt to drive taking a car onto the highway and causing mayhem. It reflects a cavalier attitude to economic expertise that has, I have argued, its roots back in the early days of Thatcherism. This advice served him well in other respects, such as establishing the form of his fiscal rule (which would help limit the impact of austerity after 2011) and creating the OBR. When people say ‘all politicians lie’, they cannot seriously mean they all hold to the same standards of veracity as Donald Trump. But how do you measure degrees of lying in politics? Paul Krugman suggests that the Republican party’s problems began when they started pushing the idea that tax cuts pay for themselves. The notion that cutting taxes will bring in more rather than less tax revenue is a theoretical possibility but has been shown by study after study to be empirically false. But why was this lie worse than others? I would suggest the following. The lie became (and continues to be) a major plank of Republican policy. We are not talking about being economical with the truth with statistics to present a party’s policies in a more favourable light. This lie was ultimately an attempt to legitimise cutting taxes on the very rich, and reducing the size of the state (because when the tax cuts did not pay for themselves the next step was to cut spending to control the deficit). It was a lie that went completely against expert opinion, and was at the heart of Republican economic strategy. Lying in this fundamental way distorts the whole direction of political activity. It and its supporters begin to focus on ways to hide the truth. It means setting up think tanks whose aim is not just to push the party line, but also to provide a counter-weight to, and therefore neutralise the power of, real expertise. Such think tanks involve an element of ‘pay us your money and we will push your interests’, which is why right wing think tanks are the least transparent about their funding. It also means using partisan media outlets to present an alternative reality to voters. If you can get away with this, then why stop at one crucial lie. Politics becomes about choosing the lies they can get away with that will promote their cause. It is about what lies sound plausible to particular voters, or what lies a partisan press can reliably sustain by selecting evidence to support them. Lines between politics and journalism in partisan outlets become blurred. We see the politics of lying all the time in totalitarian regimes, or regimes that control much of the mean of information. What I think has surprised many is that two nations that pride themselves on their democratic traditions and independent media can reach a point where the leader and ruling party of one lies all the time, and the other undertakes a huge constitutional change on the basis of a campaign where one side lied with impunity. The Brexit campaign did not lie for the fun of it, but because it would gain them votes, and what evidence we have suggests their lies were believed. It is not hard to understand why these two longstanding democracies succumbed so easily to the politics of lying. First, they tolerated the growth of a partisan media that danced to whatever tune their owners played. Second, the remaining non-partisan media placed even-handedness between each side, the political horse race and entertainment above informing the public and telling the truth. The Clinton email controversy illustrated clearly a failure to apply any notion of balance. Calling the £350 million a week figure ‘contested’ was literally being economical with the truth. The BBC’s mission to “inform, educate and entertain” has a secret caveat: informing and educating does not include anything deemed political. What I find surprising is not just that this happened, but that the non-partisan broadcast media has so little interest in doing anything about it. In the US, when Trump complained about his coverage, CNN hired someone nominated by Trump. In the UK the BBC sees no evil, and bats away letters from the Royal Economic Society about its Brexit coverage as just one more irritating complainant. Understandable given business models and constant attacks on Fake News/Liberal bias by the political right, but it means both countries remain wide open to the politics of lying. What do I mean by this? Macroeconomists have many faults, but one clear positive is that we think about systems as a whole rather than just one particular component. One area where it is important to do this is in thinking about what determines economy wide real wages. Take, for example, this recent post by the Flip Chart Rick. (His posts are brilliant and I try and read every one, but unfortunately this one is too good an illustration of the problem I have in mind.) He starts with this chart from the FT that I reproduce below. 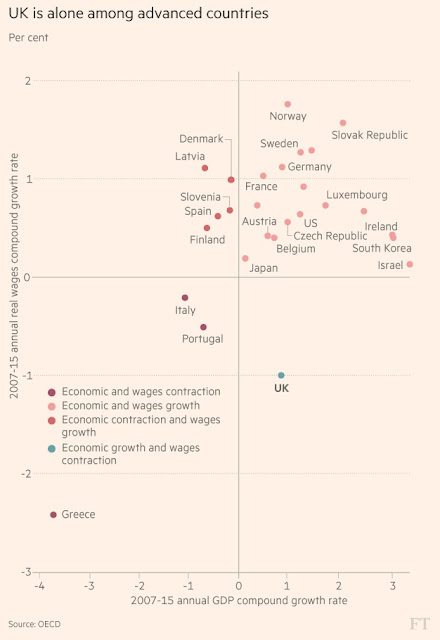 Why is the UK unique in having a combination of negative real wage growth but positive GDP growth? Now it just so happened that I had written a post about this, explaining I thought pretty well the key reasons. But Rick mentions none of these, but writes about a whole bunch of stuff related to labour market structure and trade union power that I think are largely irrelevant. I think he is making the same mistake that people make when they say immigration reduces real wages, or that we would all be better off if only unions were more powerful. All these things are important in influencing nominal wages, and perhaps the distribution of wages between workers. But real wages also depend on prices, which are set by domestic or overseas firms depending on where goods are made. If nominal wages go up, prices are likely to go up. So what do I think accounts for the fall in real wages in the UK over the last decade? We need to start with GDP per head rather than GDP: growth in the latter has been boosted by immigration. Here is what has happened to GDP per head over the last ten years. GDP per head fell in the recession, and then steadily but slowly recovered: the slowest recovery in at least a century. To see how that is related to real wages (using ONS average earnings divided by the CPI), which I call real consumer wages, we first need to look at an intermediary measure: real product wages. 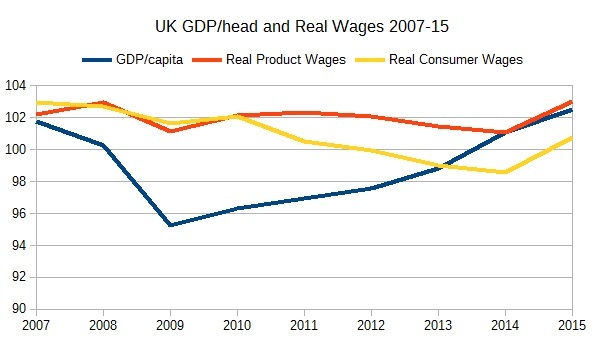 These are real wages divided by the price of UK output: the GDP deflator. This is an interesting measure because its closely related to a simple identity relating GDP to labour income and profits. We can see that real product wages have not changed very much over this period: the recession mainly hit profits, or it created unemployment. (Real wages are wages divided the number of workers, GDP per head is GDP divided by the total population, which includes the unemployed.) But if we are comparing 2007 with 2015, real product wages were as stagnant as GDP per head. So why did real consumer wages fall? That must be because consumer prices rose more than output prices. There are two reasons why this happened in this case: indirect taxes increased (remember the 2011 VAT hike), and a large sterling depreciation during the GFC worked its way into higher prices for imported goods. It is of course another depreciation after the Brexit vote that is cutting real wages once again right now. As I always try and stress, real GDP growth per head is not a good guide to real income growth if the price of imported goods rise or the price of UK goods sold overseas falls (what economists call a decline in the UK’s terms of trade). What I say about the unimportance of profits is factually true for the UK over this period, but it is not always the case. In the US and elsewhere we have seen a gradual shift from wages to profits over the last few decades. But even here it is not obvious that weak nominal wage growth is the main cause, because in a competitive goods market lower nominal wages should get passed on as lower prices. One explanation that is attracting a lot of interest is the rise of superstar firms. These firms make unusually high profits, or equivalently have low labour costs, and if output is shifting towards these firms labour’s share will fall. What these firms do with their profits then becomes an important issue. More generally, it may be the case that governments have become too lax at breaking up monopolies, allowing a rise in the overall degree of monopoly. The consequence of growing concentration, superstar firms and a rising share of profits is that income derived from profit grows faster than income from labour. I say derived from profit because I would include in this CEO and financial sector pay, which in effect extracts a proportion of profits from large firms. The net result is that most of the proceeds of economic growth are going to those at the top of the income distribution. But it would be good if we could change that by making the goods market more competitive and removing the incentive for CEOs to extract surplus from firms , rather than by making the labour market less competitive. For those who are lucky enough to have learnt economics using the Carlin and Soskice text, this is a classic application of wage and price setting curves. If workers become weaker, this shifts the wage setting curve towards the (perfect competition) labour supply curve, reducing the equilibrium real wage (unless the price setting curve is flat) but increasing the equilibrium level of employment. An increase in the degree of monopoly (the mark-up) shifts the price setting curve further away from the perfect competition labour demand curve, which reduces equilibrium employment as well as the real wage. One possible caveat here is that low wage growth may have encouraged firms to use more labour intensive production techniques, which has depressed investment and productivity. But if we want to incentivise firms to invest in more productive technology, increasing demand is a much better method than increasing nominal wages. Another caveat. I'm not sure where the real wage data in the FT chart comes from, but the fall in UK real wages there is greater than you get by using the ONS average earnings data (which I have used), so it may be a different and more specific measure of real wages. In which cases labour market structure might be relevant in explaining that number, and I apologise to Rick in advance if that is what he had in mind. By, for example, applying much higher tax rates on high incomes, or imposing a maximum wage.